1703/4 Jan 19 James son of James Weeks and Anne his wife. 1709/10 Feb 22 James the son of Henry Weekes and Mary his wife. Since he named his first two children Henry and Mary, the second looks the more probable. His mother was Mary Belsey of Nonington, 3 miles west of Tilmanstone. James appears to be the fourth child and the only son in a family of nine, only five of whom survived to adulthood. An older James Weeks who raised a family in Tilmanstone at the same time was a husbandman. It is possible that Henry’s son James was too. HANNAH MARSH. Marriages usually take place in the bride’s parish. Woodnesburgh is 8 miles north of the village of Guston. Hannah may have been living there at the time. Her baptism is uncertain. 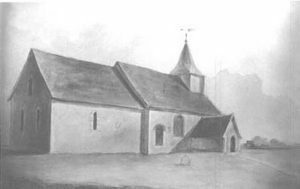 There is a baptism at St Lawrence in Thanet on 8 Jan 1709/10 for Hannah, daughter of Benjamin and Sarah Marsh. St Lawrence is the present-day Ramsgate, 7 miles north of Woodnesborough, and considerably further from Guston. This Hannah would only have been 17 at the time of her marriage. Her daughter Anna married at 15, so it is possible that this is the right girl. She would be the same age as James. The couple set up home in Guston, just north of Dover. Two children were born there. 1730 Nov 17 Henry . Henry married Susan and was buried in Guston in Oct 1754, three days after his young son Henry. 1731/2 Mar 19 Mary. In Guston the surname was spelt Wikes. We find the family next in Eythorne, 4 miles NW of Guston. 1741 Mar 21 Daniel. Buried in Eythorne 17 Oct 1765, aged 24. Neither James’ nor Hannah’s burials have been found. BMDs from Kent registers on Findmypast.